Good Morning my Bright and Beautiful Fellow Free-formists!!! Keep stayin' cool...'cause it's hot out there!!! Good Morning! What's this song? I love it!!! Good Thursday to you, Joe. Good morning Joe. I can tell this is going to be a bountiful delicious show. Our fridge stopped working over night... fun! Hello, everyone, and welcome to The Childrens' Hour! Don't open it too much - hopefully that'll help to save what's in there. Otherwise... Buffet Time! @Marcel - it could be worse. My fridge up and left me last night with my food. It's still running. This music is keeping the phone at work from ringing. Thank you Joe. My fridge conked two years ago. My water heater quit about six years ago. It seemed ironic because it was in August and very hot outside, just like it's been here lately. The last thing a person would need would be making something more hot. Already captivated by the show, cannot move away (from my computer). Don't forget the Freedom's Children, South Africa's finest! Is this really you, Joe? Or is Meghan running the thematic program today? Thanks for the concern dudes. Thankfully we hadn't stocked it in a while so no big loss. Just have to deal with getting it fixed through the landlord now, which is annoying. I just looked it up . I was a Tuesday's child. Good to know if they ever ask my birthday. Joe does this mean we'll be hearing Children of Sanchez? @Claw - Those would make good pants for a wedding reception. Not just for Halloween. What about some Children Of Bodom? @Cken - Who said anything about Halloween? Those these are come casual, everyday pants. Hahahah, Brendan, I like your style. Brendan. Hey I'm a Tuesday's child too. Never knew it it all these years! And a December's Child. My kind of playlist for a hot morning! Claw, I'm trying to think of would be most out of place on today's show and so far I think Children of Bodom is in the lead! Man all these songs are so short... you can really pack 'em in! Oh, boy! Bob is here! Just got in... and already picking up on a recurring theme.. Nothing finer than a day off and listening to my pal Joe--Cheers! They say that children are best seen and not heard. I think Joe has proven "them" wrong. How about some music from the Children Of God? I've heard Micah play some of that creepy stuff. you gonna play "Thursday's Child" the song..? You children get off of my lawn! I'm being purist, so no Children of Darkness, Lamp of Childhood, Aphrodite's Child, Children of the Mushroom, Children of Heaven, Children of the World, etc. OR Children of Bodom! are you gonna play Children of the Sun by Billy Thorpe? Hey, Pi, remember that group from the UP that used to open for Blues Hospice, Toivo's Children? they really all were Toivo's children. It was a big family. Are we setting a Guinness record? Currently bothered with a lot of Parent-Child relations, software-developement-wise. Are there any "parents"-band-names around? Anyone mention You're My Baby by The Children yet? Joe: you are on a roll today! All killer, no filler. Thanks! @steve: Bad news, Steve, I couldn't find The Children, Everybody's Children, or the Flower Children. Well, actually, iTunes had the last two, but I didn't want to buy them! feeling this soul children song. Michele & Frangry need to found a group called Friday's Children, perhaps. Guido - There's also "Bad Daddies"
Will tomorrow's geezers be in the second or third hour? I think it's a great idea. They were wrong. 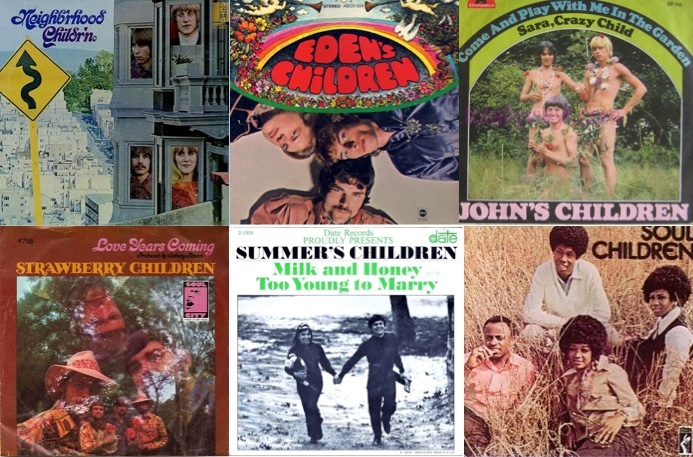 That Strawberry Children is Jimmy Webb. Gotta give it to my landlord... fridge man is already here fixing it. I hope it's a quick fix, Marcel! Good call @ DJ Joe: that was a lot of fun, but it worked a lot better as a set than it would have as a premiun. btw, listened to one of your premiums on the way home on Saturday—HOT STUFF! yeah, the space one? That was great. oh. the space one is also bangin'. Good morning Joe, fellow misfits, radio nuts and general nuts. Thanks, guys, glad you're liking the premiums. I have so much fun making them. I'd like to do 5 of them every year! Children of the 60s ain't a bad idea! what *would* be a terrible idea, would be bands from the 00s with "Eyes" in their name. @steve: Or bands from the '10s with "Wolf" in their name. Hey Joe. Marc Bolan was in John's Children or did you say that already? haha, so true. how about a 3cd set with The Best of Wolf Eyes sandwiched in between the other two. I have my workplace to myself today. Speakers instead of mono earpiece for a change! Ooooh! I am DIGGING this. ok, I liked it better before the spoken word. This has been a historic show that we can tell our children and their children's children about. Well, maybe just the first part because children shouldn't be having children. But man what a show! @steve/Joe - but.. what about Wolf Eyes? I'd be okay with some of that noise..
maybe Devin Dare should do an instrumental edit. she got better, but she's no Grandma Funk. @Brian: I totally didn't mention Marc Bolan! Or Jimmy, Uncle Michael! Glad you guys are helping me out today. 7:21 am and already funky. Funk O'Dawn. Funk-a-doodle-doo. "this apple only has one bite out of it, it's still good!" Garbage Party - another top notch premium! any chance on hearing something like Rasputins Stash? OK company-wide meeting adjourned. Back to the real business! I love this single. Never heard Sammy's version before. sweet mother of god, i can't take a half hour if you're STARTING with this. Truly random. Saw Sammy sing the Star Spangled Banner at a Dodger game once. Excellent. My CEO just talked about "flushing out" ideas. Ugh. Oh, Joe, you rascal, you. I love that you own a 45 of the Chico & The Man theme. I forgot how wonderful that song sounded. Thank you. Wow, so many Jack Albertson fans on the board! 1974? I thought Chico and the Man was a year or two earlier. Pop culture memory can play little tricks on you. Mmmm mmm mmm... Love this! @J-eff: Ha ha! Thanks, sir. I get it! the 70'S!!!!!!!!!!!!!!!!!!!!!!!!!!!!!!!! I am a child of this Era!!!! 3 "brothers" from Forest Hills Queens!!!! okay, has anyone done an premium of all soul Bee Gees covers? @Cecile: That's a GREAT idea. How could I forget Johnny!?!?!? A kid sings wistful love songs about loves past and yesterdays. Grownups wouldn't understand. Get him a cigarette and a whiskey. Spoonbread! Now that's a blast from the past! He's what I like about the south. this is funny. Funnier if you know what I was thinking. I was thinking it was more like that one Lonely Island song. Hey I have this album. I think there's only the one which is too bad. I hate to say this, but if she hadn't been married to MES, or was actually British, it might have done better. I kind of poo-poohed it at the time because I was into soul and aggro rock, which this is not. But this is quite lovely. Great wacky zang morning in the AM show today. Lots of water cooler banter material from this. And motivation to have a highjanked filled rest of the work day. "Stare in amazement/At my Hollywood basement..."
got any Eddie Holland singles in the queue? Waking Up in the Sun was an eye-opener. Phil's marriage to Alice was one the most remarkably enduring Hollywood couplings. it was a case of new Coke. Important point there, Waylon Jennings along with a whole lot of other people didn't realize that doing a lot of cocaine could cause a lot of problems. Coincidentally, I watched a Dean Martin roast of Muhammad Ali last night. Freddie Prinze was on the dais. in the 70s, it was only "psychologically addictive". Chico & the Man was the show my dad would reference as an example of good TV from his time. The b-side to Jose's "Chico" is "Hard Times en el Barrio." It's really good. Both actors were charming, but watching it later, the lines were painful. But I am not local. Sunshine and the Rain were great at Monty a few weeks ago. nice! I was gonna ask you about that. This is my kinda JM in the AM. Fridge fixed! man.. that took a long time. And now I have to go to work. Thanks Joe! Bye all. Congrats on your fixed refridge, MM. Keep those coils cool. The song title, "Chimoumounin," translates as "When birds frequently confused with pigeons have tears." Thanks for keeping me honest, bob! @Maria: Glad you're having fun! @Dean: Ha!! This Thompson album is the most obscure thing I own! Because of its unusual packaging, I see this Richard Thompson disc on the shelf every day. At first thought this was the Buddy Emmons tribute. love all the liltery lutery and harping harpsiry, Joe! @kurtgottschalk: me too re the RT man. Ditto frenchee. I seriously need this right now. This is one of those ubiquitous Nonesuch records that I suspect I've never heard. Must remedy that situation. For harp recitals, I generally turn to Andrew Lawrence-King's catalog. @Greg fr. Z5: It's like Joe KNOWS. He knows. Hello, Kurt. I have been missing the Friday show very much. I will now jump backward in the show's timeline, because I keep thinking about the Chico and the Man theme. First... I don't think I realized at the time that it was sung by Sammy Davis, Jr.
Second... I'd forgotten how thoroughly that theme laid out the show's premise. All I remembered the song being was: "bla bla bla... Chico and the Man! bla bla bla... Chico and the Man!" It's as if the writer's summary from the network pitch meeting got handed off to a songwriter with the instruction, "Set this to music." And... Oh, Freddy Prinze. That's still sad. I've really gotta get some Daniel Bachman. Great stuff. @Jeff: Hey, Jeff, Jose F. actually sang the actual theme. Sammy was just covering it! Very nicely, though. Area codes 615 and 629 are area codes in Tennessee serving Nashville and the 12 surrounding counties. 615 is the main area code, while 629 is an overlay covering the same area that began service in 2014. I remember loving Chico and the Man. Then they replaced Chico with a little boy. Also my first exposure to Scatman, whose name I had no clue about at the time. When my mom waited tables, one of her regulars was Scatman. To bring it full circle, Phil Harris also worked with Scatman Crothers on "The Jungle Book." Diamonds are so meh. This song is way better than diamonds. Thanks for another great show, Joe! Have a sweet weekend! Thanks, Claw! And thanks everyone for listening and commenting. Have a great weekend! ahhh its noon!>>!? thanks JOE! Wonderful morning, thanks to you Joe. Thank you. What he said . Peace of mind to all of you. - Thx Joe McG !